If your child is in S2/S3 then they’ll soon need to make their subject choices. It’s a big decision because the subjects they pick will have an impact on which careers are open to them when they leave school. How can you give the best advice so they can make good choices? Skills Development Scotland is here to help both you and your child. Our professionally qualified careers advisers offer career information, advice and guidance (CIAG) in every state secondary school in Scotland. There are also key tools and information on My World of Work. Make sure they, and you, have plenty of time to think it over. There’s lots of advice available but you will need time to look at the information, investigate the different options and talk it over. Every school and local authority has a different approach, so check the school website, attend information sessions and talk to the teachers and careers adviser. You’ll be able to attend the one-to-one session with your child, or at a separate time that is more convenient. Careers advisers will also be attending events for parents at the school. Listen to what your child is saying and their reasons for picking the subjects before you comment so that they feel they are in control. 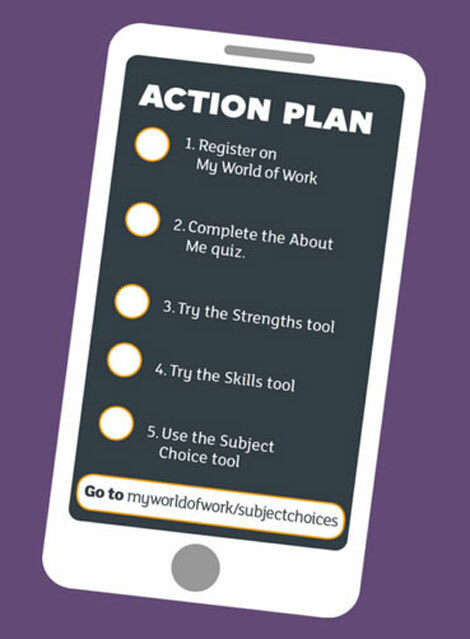 Encourage them to work through the action plan on My World of Work mentioned above. The Strengths quiz will help them to focus on what they’re naturally good at. In fact, doing the quiz together is a positive way for you and your child to start talking and sharing thoughts about what they do well, enjoy and most of all, what gives them energy. There's an About Me and Skills tool too. Discovering more about their interests and what they’re good at can help your child think about what subjects might suit them. They’ll need to register for a My World of Work account first. You can register and try the tools too. You can get useful materials from the school, and go to parents’ evenings and information events to hear more. Ask questions about the different subjects and qualifications. There’s a guide on how modern qualifications compare to older ones on the SCQF website. Your child probably already likes some subjects. They can use the subject choices tool to get an idea of what careers their favourite subjects could lead to. You can try different combinations of subjects to see what the impact would be on their future career options. The tool also includes Foundation Apprenticeships which could be a good option for your child if they’re thinking about S5 subject choices. The industry pages, which you'll find through My Career Options, also give you information about which roles will be in demand in the future. There’s only so much time in a day so it’s likely that the school timetable means some subject combinations won’t be offered. Have a look at the timetable to see what subjects are in which column. Are there any clashes? Are they subjects your child wants to do? If there is something that your child really wants to do, talk to the school and see if there’s any way that they can. It's also important to find out what additional options are there. Some schools will offer subjects in conjunction with local colleges at senior phase. Others may offer Foundation Apprenticeships, which allow your child to get experience of the world of work. Find out more on the subject choices page.